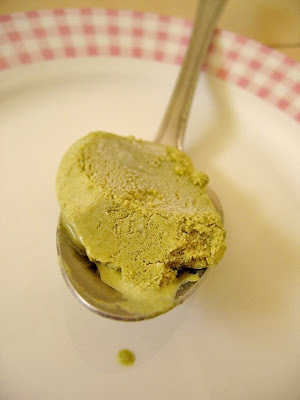 A few weeks ago I wrote briefly about my attempts at making chocolate sorbet and matcha ice cream. I promised to post up recipes and I have not forgotten. It’s just that I have been really busy at work. It is during these times when I wish I actually owned one of those fantastic Musso ice-cream machines. With a Musso, I can simply dump the entire ice-cream mixture into the machine, press a button and within 30 minutes I can have a perfect quart of heaven. Since I don’t have a Musso, I have to contend with my old-school ice and salt ice-cream churner, which doesn’t really make the best ice-cream but does allow me to come up with something quite decent. And by decent, I do mean something that kind of resembles ice-cream but nowhere near perfect. First of all, you got to understand that it’s rather humid where I live and the ice-salt combination can only reduce the temperature down to a certain point. However, today, I’m going to rave about two good recipes that I know would be 10 times better if I had a professional ice-cream maker. But until I have enough cash to actually buy one of my own, I will appreciate my beloved ice-cream churner. Dessert-lovers like me always crave for ice-cream and there is never a wrong time to have a scoop or two. 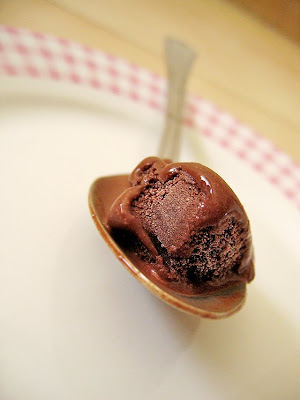 So I crave for ice-cream pretty often and will usually bookmark ice-cream recipes with the intention of making it. Sometimes I forget about it and sometimes I do end up actually making some. It really depends if I have enough ice in the fridge and if I have the time. A couple of weekends ago, I set out to make two ice-cold treats and boy was it a delicious affair. The chocolate sorbet was a shoo-in because I’ve been wanting to make something with a rich dark chocolate taste. I was sceptical of most chocolate ice-cream recipes because well, I wasn’t too sure if it was going to be chocolatey enough. Yes I’m quite particular about my chocolate, I love it dark. I first chanced upon the chocolate sorbet recipe at Su Good Sweets. I literally held my breath the moment I saw that scoop of decadent deep brown in a glass cup. You can’t really blame me for being so easily enticed. It really did look irresistable. With Su’s recipe, I made a lovely chocolate sorbet which wasn’t quite perfect (ice crystals weren’t fine enough) but it did taste super. It also had that intense dark brown appearance which I adore. As soon as I had finished making my sorbet, I made plans for another ice-cream escapade – this time involving my favourite matcha powder. You might remember my previous attempt at matcha ice-cream. It was a success but I thought there has got to be a better recipe out there. I was right. I did find another recipe and it was recommended to me by a reader who had tried it before. Though it did involve raw egg yolks, I thought I’d just give it a shot. I had great faith in the eggs – was dead sure I wouldn’t fall ill and I was right. The end result was a creamy textured matcha ice-cream with the right amount of matcha flavour made possible by the matcha powder of course. The recipe is apparently Harumi Kurihara’s. She’s a well-known Japanese cookbook author. Her recipes have received rave reviews so I was absolutely sure her green tea ice-cream recipe won’t fail. Thank god it didn’t. These days I don’t buy green tea ice cream anymore. I’d rather make my own. I await the day I can own my very own Musso and be totally bowled over. Then I will never have to settle for ice-cream that’s second-best, ever again. Combine cocoa, sugar, salt in saucepan and whisk in 1/2 cup boiling water to make a thick paste. Add the remaining water. Stir over medium heat just until tiny bubbles form at the edges of the pan. Don’t cook any longer, as the heat can damage the flavor of the cocoa. Take the mixture off the heat and add the vanilla. Refrigerate until cold, at least 4 hours. Add the rum or vodka, if using. Freeze in an ice cream maker according to the manufacturer’s instructions. Harden the sorbet in the freezer for at least 3 to 4 hours. Note: The flavor is so rich that you can substitute half of the water with milk. 1. In a small bowl, mix the green tea powder with 2 tablespoons of the granulated sugar. 2. In a separate bowl, mix together the egg yolks and remaining sugar. 3. Pour the milk into a small pan and gently heat taking care not to let it boil (ideally the temperature of the milk should be 80oC). Remove from the heat and mix a few spoonfuls of the warm milk with the green tea powder and sugar in a small bowl. When you have a smooth paste, add it to the remaining milk in the pan, then gradually combine with the egg yolks and sugar mix. Leave to cool. 4. Lightly whip the cream till slightly firm and then add to the cold green tea milk mixture. 5. Transfer the mixture to a large container and put it in the frigde. Leave overnight. hi, where did u buy your macha powder from? Hi. I’ve been visiting your site occasionally for reference on where to get certain food and I must say, you’re recommendations are pretty good. Absolutely loved Victor’s Kitchen and Miss Clarity Cafe. Can’t stop thinking about the dim sum at Victor’s. Just happened to be reading again and saw your Frozen Delights post. I really really like green tea ice cream and would like to recommend the Nissin version. I only found amazon.com to have to have more description on the product. It’s here http://www.amazon.com/Nissin-Green-Cream-Powder-Macha/dp/B000KDFCYQ I believe it says Creamy Ice Mix just below the Nissin logo. And there are easy-to-understand pictures and japanese instructions at the back of the box. I bought mine at the Punggol Plaza NTUC. Can’t seem to find it in other NTUCs. As for me, the rhum/vodka for the chocolate sorbet SHOULDN’T be optional! 🙂 Awesome photos, applause to you for the yummy-looking frozen delights!